With Better Homes and Gardens Rand Realty’s recent expansion into the Bronx, we are delighted to present the inaugural Rand Quarterly Market Report for Bronx County. We have been providing these quarterly market analyses for almost 15 years for the markets we service, which now include Westchester and the Hudson Valley, Northern New Jersey, and now the Bronx. We hope you enjoy the Report, and if you have any questions, please reach out to your Rand Realty agent. The Bronx housing market surged again in the second quarter of 2018, with both sales and prices rising sharply in a growing seller’s market. Going forward, we expect these trends to continue through a robust summer and fall selling season. Sales were up overall, and for most property types. For the borough as a whole, sales rose 4% in the quarter, continuing a yearlong trend that saw transactions go up over 8% for the rolling year. And sales were up for most property types, rising over 3% for single‑family, 5.7% for coops, and a whopping 32% for condos. Although sales fell about 4% for multi‑families, that was after a tremendous run‑up over the last year, where sales spiked almost 16%. Prices were also up sharply. For all property types, average prices were up about 7% for the quarter, and now up almost 10% for the rolling year. And we saw the same story in each individual property type, with quarterly average prices for single‑families up 7%, multi‑family up almost 14%, coops up 3%, and condos up just a tick. Inventory continues to fall. We measure inventory by looking at the number of homes available for sale, and the rate at which homes are selling. A balanced market has about six months of inventory, meaning that at the current rate of home sales it would take six months to sell all the homes currently available. 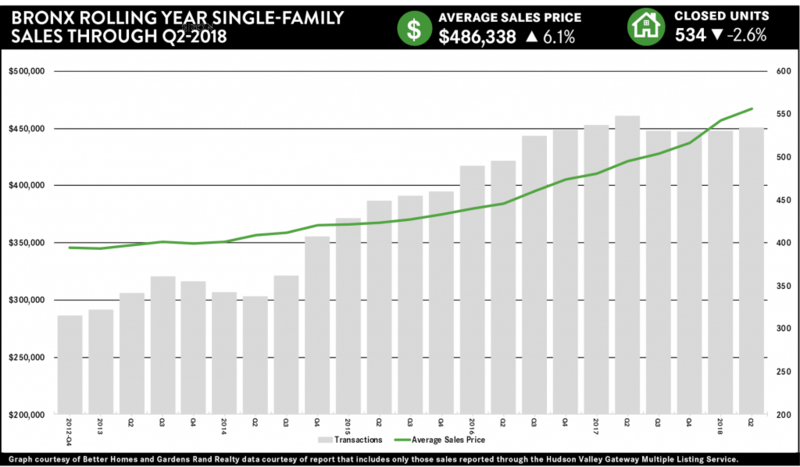 What we’re seeing, though, is a clear sign of a seller’s market, with the months of inventory well below six months for all property types: 4.7 for single‑family homes, 5.6 for multi‑family, 4.7 for coops, and 4.5 for condos. Moreover, inventory is still falling, dropping sharply for every property type, which means we still continue to see upward pressure on pricing. Overall, this is exactly what a robust seller’s market looks like. We have high demand and falling inventory driving sales and prices up throughout the borough. Textbook economics tells us that rising prices will eventually attract more sellers into the market, and maybe stifle sales simply by reducing the options available to buyers. But in the meantime we can expect that high demand will continue to drive prices up through a sizzling summer and fall market.